The Sharie Withers Agency is pleased to announce the initiation of a master charity program serving Tyler, TX, and invites support from the agency’s network of professional partners and clients in benefitting deserving local organizations, families and individuals. The inaugural campaign will raise funds to help provide clothing to those in need in collaboration with Jesus’ Closet. The Sharie Withers Agency in Tyler, TX is pleased to announce the commencement of a master charity program created to assist deserving local organizations, families and individuals. The agency pledges to select a new beneficiary every 60 days, working closely with nonprofit groups and community leaders, in order to bring attention to important local causes through the formation of campaigns which will better allow clients and the community at-large to ‘live well and thrive’. 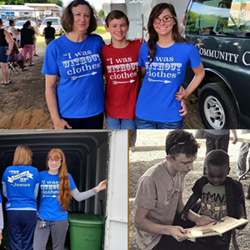 To debut their new community enrichment program, Sharie Withers, owner and president of The Sharie Withers Agency, has chosen to throw support behind Jesus’ Closet, which provides clothing, shoes, socks and toiletries to those in need. The ministry visits schools and low-income areas to provide both donated and purchased items to children and families who are unable to purchase these necessities for themselves. Committed to serving others, the caring volunteers of Faith Community Church also offer kind words and the love of Christ in their devoted service of others. To join the agency in support of Jesus’ Closet, donors may visit: http://www.withersagency.com/Serving-One-Another-In-Faith_12_community_cause. The campaign page for each featured initiative will be accompanied by a fully detailed story outlining the cause, and the caring team at Sharie Withers Agency will work hard to spread the word by mobilizing it’s own vast network of customers, business associates, neighbors and friends behind each campaign. The agency also produces a monthly print and digital publication, Our Hometown magazine, which will reserve a full page highlighting each cycle’s selected Community Cause. The electronic Flipbook version of the current issue of Our Hometown may be accessed here: http://www.withersagency.com/Our-Hometown-Magazine_39. To learn more about The Sharie Withers Agency ‘Agents of Change’ movement, and bookmark the Community Cause page for future reference, please visit: http://www.withersagency.com/community-cause. More information on the agency and the products and services they offer is available at: http://www.withersagency.com/. An award-winning, full-service insurance provider serving families from two locations in Tyler, TX, agency owner Sharie Withers knows many local families. The knowledge and understanding of the people in her community help Sharie to provide customers with an outstanding level of service, characterized by a caring, personal touch which develops special, trusting relationships. Sharie and her team of dedicated professionals look forward to helping families protect the things which are most important to them – their families, homes, cars and more. They can also help clients prepare strategies to achieve long-term financial goals. To contact a caring expert at The Sharie Withers Agency, please call 903-561-2112.